﻿ It’s always interesting to see what gems from the past time will throw up, especially ones that have remained totally detached from a modern context in every way. 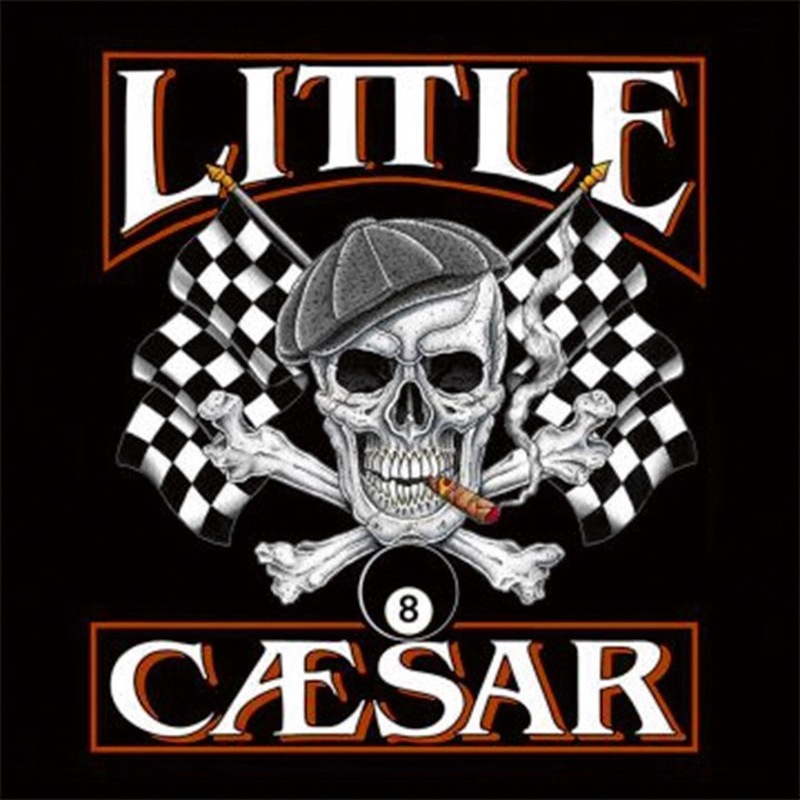 Of course, it’s a stretch to call Little Caesar a gem, and if the most familiarity the name holds is thanks to the pizza chain, no one would really be surprised. They formed during the last gasp of hard rock in the late ’80s anyway, rather prophetic of the fact that they eventually split in 1992. But apparently they’ve been reformed since 2001 and releasing new music since 2009, solidifying the fact that, even for largely-forgotten hard rock has-beens like this, there’s still some kind of market. Okay, to call Little Caesar has-beens might be slightly unfair; after all, they’re arguably in a better position now than when they formed, in a scene that, for some reason, can’t let go of relics of the past, no matter how close to fossilisation they are. But for as uninspired and gout-ridden as so many of the classic rock revival bands are, surely there’s something out there that’s better than this. At best, Eight is a semi-tolerable hard(ish) rock album that can muster up a solid hook when it wants to; at worst, it’s the sound of a midlife crisis happening in real time that inspires no reaction more telling that a head in hands. First though, it’s worth noting that Little Caesar’s game plan is relatively easy to pick up on, namely a band who clearly weren’t tainted by the glamorous rockstar lifestyle and, in the same vein as AC/DC, operate as the working man’s alternative to the flashy hard rock of the ’80s. Thus, Eight feels slightly more grounded as a result, and with tracks like Vegas and Straight Shooter that are a bit more greasy and less bombastic in sound, and have the punch that hits a tiny bit harder. Ron Young’s vocals have a similar effect too, somewhere between Brian Johnson and David Lee Roth that isn’t necessarily distinct in its own right, but has the power and boozy swagger that these songs ultimately require. On the other side of the coin though, there’s Little Caesar dusting off the petrified remains of a rock ‘n’ roll sound that might have sufficed three or four decades ago, but certainly doesn’t now. And this is more than just sounding a bit dated or tired (which, for the record, Little Caesar do); this is co-opting sounds that have no business being in a band’s wheelhouse if they want to sound even remotely relevant, and thus the thinned-out biker bar rock of Crushed Velvet and Another Fine Mess and the deliriously cheesy Mama Tried are all the more indicative of a band who have no idea to sustain a career that’s capable of growth. This is perhaps one of the most stagnant, uneventful albums to be released in some time, already hindered by a hard rock template that, in itself, has precious little mileage yet, but actively doubling down on its least palatable elements. And when that all circles back to Eight as a listening experience, it remains so dull and forgettable that it’s honestly worth wondering what the point was in even dedicating time to it. But at the end of the day, it’s not worth getting annoyed at Little Caesar for this. They’ve never really been relevant, and they fact that they continue on that streak in the 21st Century isn’t exactly front page news. But they could’ve at least tried to work through the glaring flaws in their sound for something a bit more contemporary and exciting, rathing than ripping those holes even wider. If this was a band with some actual clout and recognition behind them, the tone of these criticisms would be a lot harsher; at it stands, Little Caesar’s state of having no one care just continues without a hitch. ‘Eight’ by Little Caesar is out now on Golden Robot Records.